The lead story on the New York Times site was that China had criminalized the coverage of any rapidly-breaking news event in the country that it had not authorized correspondents to write about. I'd followed the plight of Chinese writers closely for years. When a journalist in China was jailed for sending an e-mail, or when a newspaper editor there had his fingers hacked off by regime thugs for exposing the corrupt local party boss, I fired off op-ed pieces that came out in newspapers around Asia. This new measure would clamp tight official control over what 1.3 billion Chinese could know. And yet I felt nothing, one way or the other. The development left me numb. I closed out of the site and sat there empty and sunken in the chair, staring off into space ' wondering where my feelings had gone. 'Do you want to drive up to Chingjing Farm for just an hour or two?' Shuyuan called out from the next room. She'd spent the previous day and all this morning out at the dining room table grading student papers. From her voice I could tell she'd reached her limit and needed a break. She'd taken me to see Chingjing Farm three years back, the year I arrived in Taiwan. 'O.K.' I said. 'Let's go.' The mist outside had unexpectedly lifted, and bright sunshine burst in through the windows. Maybe a break would be a good idea. I closed down the computer. The first time I went with Shuyuan to Chingjing Farm, I saw trees were trying to grow back in places. The mountaintop pasture had once been forest. The sightseers from lowland towns were thrilled to see cows, goats, and sheep locked up in their pens. How much I would rather catch a glimpse of one of the many indigenous animals that had once roamed these slopes, endemic varieties of black bear, clouded leopard, sambar, serow, reeve's muntjac, or pangolin. I'd not seen a one. I might never get to. According to one Internet site, some already teetered on the brink of extinction. I still saw all that, like before. Only, this time I felt nothing, one way or the other. A rich and complex landscape millions of years in the making with unique features and species found nowhere else had been eradicated and replaced with an impoverished and unstable one with features and species common everywhere all over Taiwan. How could I not feel anything about this? I wondered. Was it too big to keep registering? Nerve endings stop responding to the same stimulus over and over. Emotions adjust to what has happened, and eventually come to view the shocking as natural. Had something like this happened to me? I caught myself throwing appreciative glances at the big showy farmhouses down in the river valley and at the fairyland patchwork of gardens and fields around them ' and thinking that the people here had put the mountain landscape to good use. 'Should we stop at the Starbucks for coffee?' Shuyuan suggested as we began our final ascent to Chingjing Farm. Three years back when we came, she brought along a newspaper clipping from the Chinese language daily she then subscribed to. It was a promotional write-up for a new mountaintop shopping mall that featured the 'highest Starbucks in Taiwan.' We'd had no trouble finding the place. We merely had to follow the traffic right into the parking lot. The Starbucks logo was prominently displayed and led us up several flights to the mall's top level. We waited in line, picked up our latte, took a seat, and began sipping foam from the top as we looked out at the mountains opposite and the valley below. 'Next time let's don't come on a weekend,' I said. Shuyuan lowered her window. 'Where can we park?' she called out to the nearest officer in Chinese. 'There is no place,' the harried policemen snapped back as he waved us on. We drove on up the road looking for a place to turn around. The throng of cars followed us around the bend and into a small mountain village of hotels ' all built in a Swiss style, with steep, pointy roofs and white plastered walls crisscrossed with exposed timber beams. Mixed incongruously in with these fake Swiss chalets were typical Taiwanese street houses, dirty and unsightly structures pushing right up against the edge of the road, as down in the lowland towns. 'Let's have breakfast,' Shuyuan suggested. 'This is Hehuan Shan,' Shuyuan said in surprise. With the intensity of a mystical vision, the giant trees flashed only for an instant before us and then, as we cautiously rounded the bend, vanished back into the mist. I was left feeling I'd been delivered up for just that burst of a moment ' like great artistry can do, or the majesty of nature ' to my own deepest and truest aspect, the part of myself primal and pure, never sullied, and out of which all the rest can unfold anew. It was one of those magical moments that arrive without warning, where gazing outward, the glimpse is inward. In myself, at that moment, I recognized the source of Chinese art 'the source, it even seemed, of China. And I knew that however successful China's usurpers continued to be in miniaturizing the spirit of the 1.3 billion in order to further their own small, corrupt ambitions; again and again in some one person or another, the real China would rise up ' full, complete, and all-powerful as it had so many innumerable times in the past. Not even this new law they'd passed, on top of everything else they were doing, could keep the truth out of that country because truth ultimately issues most purely from within and always in a unique and unpredictable way. 'Is this Hehuan Shan?' Shuyuan asked in Chinese. Ever since I was a child, I'd felt the appearance of a cardinal a special occasion. A red bird is a rare and wonderful thing. 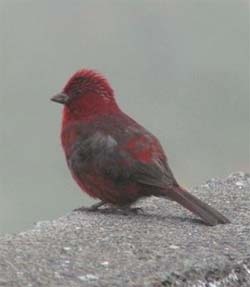 This little bird, though, wasn't the crimson American species with the pointy tip to its head. Surely it wasn't a cardinal at all but some kind of Asian bird I would have no way of knowing about. Its red plumage had dark streaks running through it. Its crown feathers were puffed evenly up all over, making its head look larger than it was. I know nothing about birds, but I do take an interest when I see a special one; and this kind I'd never seen before in Taiwan. I guessed it must be, like the unique plants in these high mountains, endemic to this specific area ' and rare. 'He's got a stone,' I cried out in alarm to Shuyuan. I let go of her hand and stood there. I wasn't going to let this pass. 'He's going to throw the stone at the bird,' I cried out in a more insistent voice. 'Ask him in Chinese why he would kill a little bird like that for no reason,' I demanded, hot with feeling. 'That man is going to kill the bird!' I spelled it out to her point-blank. 'The man is going to kill the bird!' I demanded that she comprehend. 'Why would anyone kill a little bird like that?' I cried out. 'Why did you do that?' Shuyuan cried out at the man in Chinese, in a way that made me proud of her. Later she told me when she was a child growing up in the countryside outside Yuanlin she'd often seen little boys with slingshots going around killing birds. But the idea that a grown man would do something like that ' this caught her completely off guard. She couldn't imagine it until she'd seen him throw the stone. 'Why would you have done a thing like that?' Shuyuan lashed out at the man. There was derision in her voice, and censure.